A 90-member delegation held strategic meetings with 24 global high-tech companies and organizations in Silicon Valley over the summer. Apple names game created by three RIT students one of the best apps of 2016: The game app, called Dividr, took home an Apple Design Award at the tech giant’s Worldwide Developer Conference. Computer science graduate program ranked among best in the nation: RIT is one of the top colleges in the nation for students completing a master’s degree in computer science, according to new rankings from GraduatePrograms.com. RIT included in ‘Fiske Best Buy List' for 2017: RIT has again been named a Fiske “Best Buy” school, one of only 26 private and 21 public universities included in the 2017 edition. RIT ranked among the top U.S. computer science and engineering schools: RIT was ranked among the best computer science and engineering schools in the Northeast and U.S. in the most recent Business Insider ratings. 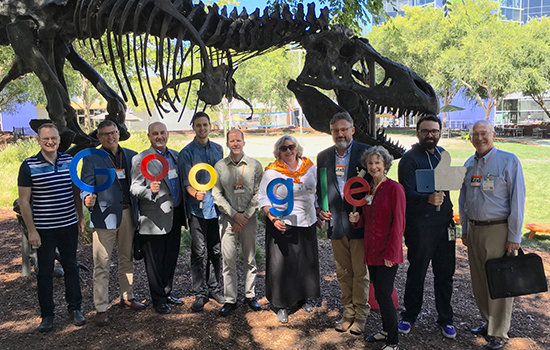 RIT leadership embarks on ‘Silicon Valley Engagement Initiative’: A 90-member delegation held strategic meetings with 24 global high-tech companies and organizations in Silicon Valley. Dan Schneiderman represents New York state at White House ‘makers’ event: Schneiderman, FOSS@MAGIC Research Associate and Community Liaison, was selected to attend the National Week of Making Kickoff at the White House. Humans of New York creator coming to Brick City Weekend: Brandon Stanton, who created the Humans of New York blog and books depicting portraits of life and individuals in New York City, is this year’s Horton Distinguished Speaker. RIT offers singing, storytelling and photography at this year’s Fringe: Students, faculty, staff, alumni and Osher members are part of an eclectic lineup of performances in this year’s Fringe Festival. Video: Undergraduate Research Symposium: The 25th annual RIT Undergraduate Research Symposium featured more than 250 student presentations. Undergraduates from all of RIT's colleges display the research work they have completed in the past year. Esteemed researcher to lead new Center for Cybersecurity: Matthew Wright, a leading expert in internet security and privacy, will join RIT in August as director of the new Center for Cybersecurity. Manian Ramkumar named interim dean of CAST: Manian Ramkumar, head of CAST’s manufacturing and mechanical engineering technology department since 2013, assumed his new post on July 1. RIT appoints its first chief marketing officer: RIT has chosen John K. Trierweiler to be its chief marketing officer, a new position for the university. Video: Beekeepers Club Helps Protect Honey Bees: Founded in the fall of 2015, the RIT Beekeepers Club aims to educate the RIT community on the issues facing the honey bee population. Video: Graduate Donates Kidney to College Roommate: When alumnus Rob Glaspy ’13 needed a new kidney, his college roommate Billy Gerken ’15 stepped up to donate one of his own to save Rob’s life. Athletics Hall of Famer Mike Lawson has NTID scholarship named in his honor: The Lawson scholarship will support deaf and hard-of-hearing students in the College of Liberal Arts and in the NTID Master of Science in secondary education programs. Softball advances to first Liberty League Tournament in strong 2016 season: The softball team enjoyed a strong 2016 season, recording 17 wins while advancing to the Liberty League Postseason for the first time since joining the conference in 2012.